The leader of the Indigenous People of Biafra, Mr. Nnamdi Kanu, has been released fromthe Kuje Prison in Abuja after meeting the bail conditions granted him by a Federal High Court in Abuja on Tuesday, says his lawyer, Mr. Ifeanyi Ejiofor. Ejiofor said his client met all outstanding conditions on Friday and was released shortly after all necessary documents were signed by the trial judge. “Nnamdi Kanu left the prison at about 5pm after meeting the bail conditions,” Ejiofor told PUNCH correspondent on the telephone. 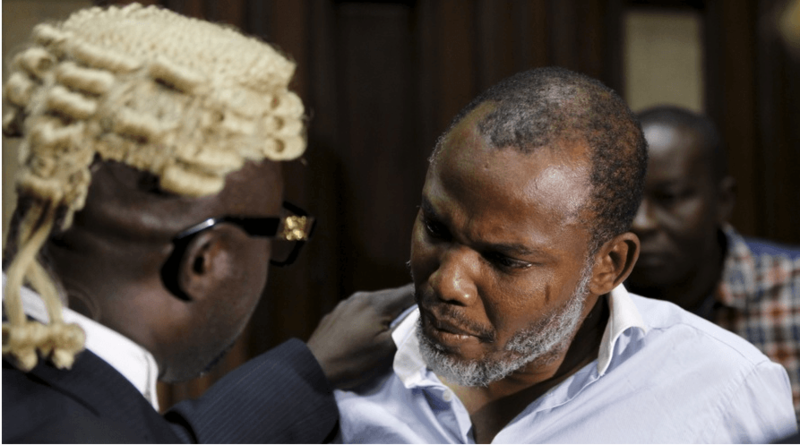 Justice Nyako had on Tuesday granted bail to Kanu, who along with three others are being prosecuted on charges bordering on treasonable charges. She said Kanu was granted bail on health grounds. The judge however barred the IPOB leader from granting press interview while on bail. 0 Response to "Breaking News: Nnamdi Kanu released from prison"